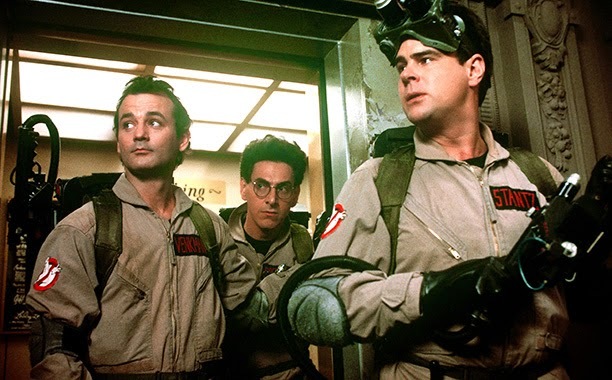 Reel Talk Online: Hollywood Laziness Strikes Again: BRIDESMAIDS Director to Helm a "GHOSTBUSTERS for Women"
Hollywood Laziness Strikes Again: BRIDESMAIDS Director to Helm a "GHOSTBUSTERS for Women"
You know what I'm tired of? Well, actually a lot of things. But do you know what I'm tired of at this very moment? Hollywood try to cater to women and audiences of color by lazily rebooting older films by adding the insulting tag line "with women" or "with black people." We've seen it recently with the forthcoming Expendabelles (you know, Expendables but "with women") and Annie (the exact same movie from before but, you guessed it, with black stars this time). We even saw it with the sleeper hit About Last Night, a remake of the 1986 romantic dramedy About Last Night... (which had an all-white cast). As I'm written before on this blog, I don't always have such a knee-jerk adverse reaction to all reboots like many of my counterparts, especially since some of these cinematic revisits I've been pleasantly surprised by (including About Last Night). But it's the careless marketing that grates on my nerves most. Dear Hollywood: no so-called target audience likes to be told explicitly that they're you're target audience. Don't tell me what movie I'm going to like or dislike simply because you say so. As a matter of fact, I have no problem with Expendables, About Last Night... and Steel Magnolias (which was recently remade with an all-black cast on Lifetime), and don't have qualms with their reboots (save for SM, which was awful but the talent was there). What I do have a problem with is the assumption that these certain groups (women and people of color) do not have their own stories to tell. In fact, there are plenty of original musicals with talent of color that are just waiting to be brought to the big screen (hello, I'm still waiting for Memphis, Passing Strange and Porgy and Bess to happen). There are plenty of women-driven sci-fi and horror comedies that have never seen their way onto the big screen. So many movies are adapted from books, but a much smaller percentage of them are genre stories featuring women and people of color that Hollywood has conveniently overlooked. Repeatedly. Thankfully the small screen is making up for Hollywood's sshortsightedness with shows like Sleepy Hollow, True Blood and Orange is the New Black. But it's high time for the big screen to catch up with this. At the very least, stop acting as though there's such a shortage of stories that already feature these target groups (which reminds me of a particularly eyeroll-inducing article in The Hollywood Reporter that asked "Who is the New Denzel?"). My Gawd, the inertia from Hollywood when it comes to women and talent of color is absolutely mind-numbing. Puhl-lease do better. I'm sorry if I throw Hollywood off by avoiding so many sloppy romcoms "aimed at women" or the 9,000 Tyler Perry movies that come out each year, in favor of the smaller independent films or movies like Man of Steel or Think Like a Man. But I can't be the only one who's sick and tired of the okey doke. While the idea of a horror comedy with a female cast is enthralling (and I do love what Feig did with Bridesmaids), would it be too much to ask that we headline a fresh franchise of our own? I mean, is it just me?? Creativity is certainly lacking and these type of cheap spins on tired plots are a real cop out. Great post! I agree with pretty much all that you've said here. When I saw this Ghostbusters thing, my immediate reaction is that it would be too gimmicky and distract from everything else. It's just about money, right? New, original scripts are a total gamble, while remakes and recasts hopefully come with some built in audience I would imagine. So in addition to being offensive and stupid, these filmmakers and investors are also chicken, too.